The EU’s shock rejection of Theresa May’s Chequers plan threw Downing Street into a tailspin. 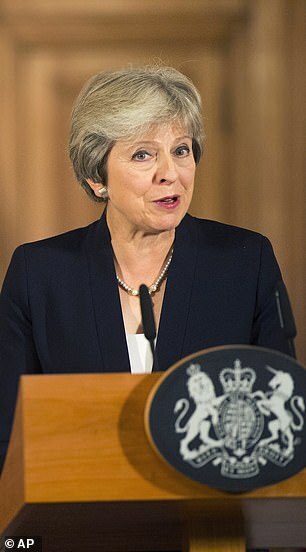 An agreement already loathed by large sections of her party for cleaving too close to Brussels had been thrown out by European leaders for being too advantageous to the UK. It is that mind-numbing difficulty – of devising a plan acceptable to the EU that would also be voted through a hung Parliament – which has led two senior No 10 advisers to advocate the previously unthinkable: another snap General Election. The powerful aides have argued in the wake of the Salzburg humiliation that the only way to ‘make the Commons arithmetic work’ could be to ditch Chequers, and please the Brexit wing of the Tory Party by swinging behind the ‘Canada model’: leaving the Single Market and Customs Union completely, before striking a free-trade deal with Brussels. With her party’s most militant wing now behind her, Mrs May could then go to the country in November and win a majority sufficient to push through the deal – over the objections of pro-Remain MPs – when it was put to the Commons vote. 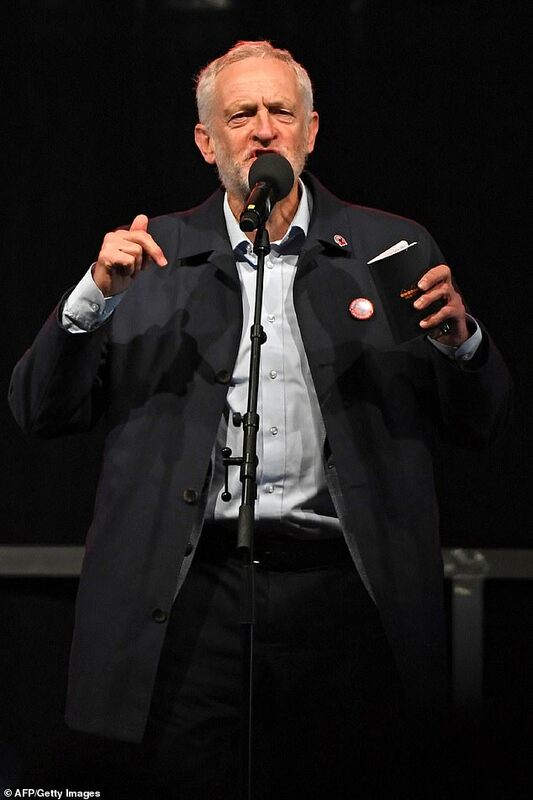 Their ‘wargame’ scenario has been boosted by the latest polling which indicates a slump in support for Jeremy Corbyn among those who voted Labour at the 2017 Election. About 63 per cent of 2017 Labour voters now view Mr Corbyn in a favourable light, down from 86 per cent in June last year. Overall, the Tories have a four-point lead. A source said: ‘It is being discussed seriously. As things stand, even if we get a deal with the EU, it is hard to see us getting any agreement through the Commons. Even if the EU backs down on its Salzburg stance and accepts Chequers as it stands, Mrs May will struggle to win the crunch Commons vote. The idea is likely to send a shiver through Tory MPs still haunted by the Prime Minister’s catastrophic performance at the 2017 Election, which led to the elimination of the Conservatives’ majority. 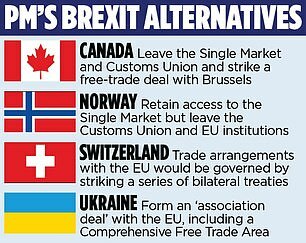 Attempts by both the EU and UK sides to break the deadlock have been fraught with difficulty.At one stage, The Mail on Sunday understands that officials working for EU chief negotiator Michel Barnier told Brexit Secretary Dominic Raab’s team that the UK had to choose between four ‘off the peg’ models for a deal – Norway, Canada, Ukraine or Switzerland. However, it offered to ‘camouflage’ the process by describing whatever was chosen as ‘bespoke for the UK’ to limit the political fallout in Britain. The offer was declined on the grounds that it would ‘fool no one’. The Salzburg fiasco has also led to renewed criticism of Mrs May’s Brexit adviser, Olly Robbins, who is being blamed within Downing Street for intelligence failures about the mood on the continent towards Chequers which led to Mrs May being blindsided. 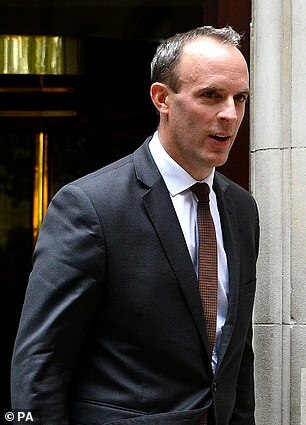 Mr Raab has successfully asserted his control over Mr Robbins by insisting that he is shown copies of documents produced by the adviser at the same time as the PM. The Brexit Secretary will tomorrow announce the final batch of ‘technical notices’ covering the UK’s preparation for no deal in several areas including flights, motor insurance and pet passports. The ‘wargames’ inside Downing Street have also extended to the emergency summit in November when the final Brexit deal is due to be signed off. Frustration in No 10 has grown over the EU’s insistence on a ‘backstop’ arrangement for Ireland if a deal is not cut on avoiding a hard border between Northern Ireland and the Irish Republic. The EU’s plan to keep Northern Ireland in the Customs Union, large parts of the Single Market and the EU VAT system would effectively create a border down the middle of the Irish Sea, which Mrs May rejects as a threat to the integrity of the UK. Under one plan which has been discussed, the UK delegation would physically walk out of the summit in November and refuse to return unless the EU compromised. Pro-Brexit Tory MPs, who object to Chequers on the grounds that it will lash the UK to many EU regulations after Brexit, accuse No 10 of using the ‘threat’ of an Election to cow them into submission on key votes.During charm-offensive dinners at Downing Street and arm-twisting meetings with Chief Whip Julian Smith, the threat of losing their seats or ushering a Corbyn-led government has been deployed repeatedly. However, last night one long-standing, pro-Brexit critic of the Prime Minister admitted that if she called a snap election on the platform of negotiating the Canada model, he would ‘hold my nose and endorse her’. A Downing Street spokesman said: ‘The Prime Minister is fighting for the best deal for Britain and is in the job for the long term. Was it a glass half-full or a glass half-empty when two Brexiteers enjoyed a drink yesterday? Former Brexit Secretary David Davis and ex-Ukip leader Nigel Farage were taking part in a pro-Brexit rally when they stopped for some light refreshment. The pair had shared a platform for the first time at the cross-party Leave Means Leave event in Bolton alongside Labour Brexiteer Kate Hoey.Mr Davis quit the Cabinet in July in protest at the Prime Minister’s Chequers deal and what he considered were unjustified concessions to Brussels. He told the crowd yesterday that he viewed ‘with contempt’ the behaviour of European leaders towards Mrs May at last week’s Salzburg summit. ‘If you think you can bully this country, I suggest you read some history books,’ he said. Mr Farage, who is credited with turning Ukip into a political force that made David Cameron call the EU referendum, declared that a no-deal Brexit would be ‘no problem’ for Britain and there would be no ‘cliff-edge’ as feared. He added that the political class ‘do not want to give us Brexit’ and instead are trying to overturn the referendum result.